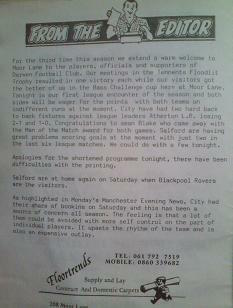 A look at a matchday programme from twenty-odd years ago.There was a fair amount of press afforded to Salford City at the start of this year due to the partial ownership of a certain bunch of Manchester United academy graduates and their action of cruelly and unfairly dismissing the previous manager (there is no bias involved here at all, I promise you). Paul Scholes and Phil Neville even took on a caretaker management role for a match against Kendal Town, resulting in a 2-1 win before the appointment of former Mercury Music award winner Antony and the Johnsons shortly thereafter. The appointment turned out to be a masterstroke in the end with the art pop warbler winning fifteen of the remaining seventeen games and in doing so leading his side to promotion to the Northern Premier League Premier Division Premier Premier Northern Division at the end of the campaign. Back during the 1992-93 season that this North West Counties League Division One clash with Darwen took place Ryan Giggs was winning the PFA Young Player of the Year award for the second year in a row and there were just two substitute appearances for Man United between the other four current co-owners. Presumably they were all too busy hatching their future plan to purchase the Ammies. At first glance 30p seems like a pretty good deal for this “matchday magazine”, but it must be remembered that this was back in the early 90’s when a mere five English pound could purchase you roomy property in the center of London. The content within is surprisingly generous and contains editorials, a newsletter, and a lengthy article on the history of their opponents where we learn they were one of the early pioneers of floodlit football and also how they came to adopt the club colours of Arsenal. All of this is doubly impressive when considered the article was written B.W. (before Wikipedia) and some actual research will have been needed to be done to unearth these fascinating nuggets. The writer of the From The Editor section doesn’t mince his words and spends a whole paragraph bemoaning the sides discipline, urging players to display “more self control” and complaining that the constant bookings “upsets the rhythm of the team and is also an expensive outlay.” Perhaps player/manager Billy Garton was amongst the recipients of that advice as he had been sent off in his first game for the club after, in his own words, “smacking a player in the face”. Garton, who had been born in Salford, wouldn’t be at the club long before leaving for Witton Albion in the Unibond Premier and then enjoying a spell at Hyde before becoming a Deputy Head at a primary school in Altrincham. This second half of his career club-hopping in non league football was in stark contrast to the first when he had been contracted to Manchester United, albeit only making fifty one appearances in six years due to injuries, eventually succumbing to M.E. which forced him to retire from top level football. He now resides in San Diego, California where he helps run a youth soccer club – a genuinely happy ending to a story that began in poverty and had many setbacks along the way. The middle part of the programme is taken up by the entertaining Bass North West Counties Football League Newsletter which rounds up the most interesting news from the clubs involved. It is here that we learn that celebrity star gazer Russell Grant presented the Sportslines Inter-League Challenge Cup to the Bass NWC League captain Michael Bates after victory against a Hallmark Liverpool County Combination eleven in front of what is described as a “very healthy” crowd (presumably the rotund Russell Grant withstanding). We are also informed of Nantwich Town’s “exciting 17-year-old Dougie Dawson” and the “host of admiring eyes” he’d attracted recently. Amongst those admiring eyes must have been the scout of the mighty Stafford Rangers as two years later he would sign on with them for the astronomical fee of four thousand pounds. His career was so “exciting” from then on that the Internet has literally nothing else to say about him. Amongst the players involved in this match for the home side were Jimmy Shields (presumably not the Jimmy Shields who would have been 61 at the time), future club chairman Darren Quick, and future fictional Coronation Street character Martin Platt. The referee, I am proud to report, was a Mr. S. J. Griffiths of Macclesfield. As with the future of poor Dougie Dawson the result of the match hasn’t been archived (the North West Counties Football League website only lists Salford’s F.A. Cup and F.A. Vase matches from that time) so here’s hoping Mr. Griffiths took prospective revenge for the Phil Power debacle by sending off a couple of Salford players and awarding Darwen a penalty or two. A loyal lot, us Macc Town fans. Posted on July 26, 2015, in Kieran's Classic Programmes and tagged Darwen FC, Featured, Salford City. Bookmark the permalink. 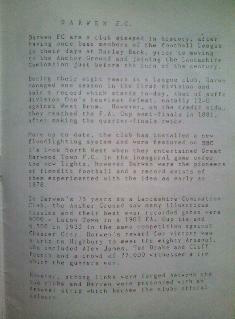 Comments Off on Classic Programme – Salford City vs Darwen.